Sometimes attaining a length of more than 7 feet, the Diamondback Rattlesnake is the largest, heaviest, and perhaps most beautiful of the American pit vipers. It used to be very common but has become less obvious in the palmetto country of Florida and adjacent Gulf states. These heavy snakes often move by rectilinear motion, sliding the belly skin forward and backward but keeping the body moving constantly in a straight line. They swim very well, reach many of the coastal islands, and have been found miles out to sea. While the Diamondback feeds on various small mammals, adults feed extensively on rabbits. The fangs are proportional to the snake’s length, and although the venom is not particularly potent, the amount of the dose and the depth of the bite determine its danger to man. 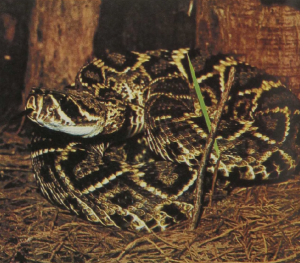 The rattle on the snake’s tail consists of wedged caps of keratin. Each time the snake sheds its skin (sometimes four times a year), one more cap is added. When the tail is vibrated, the rattle makes a sound that may deter predators.